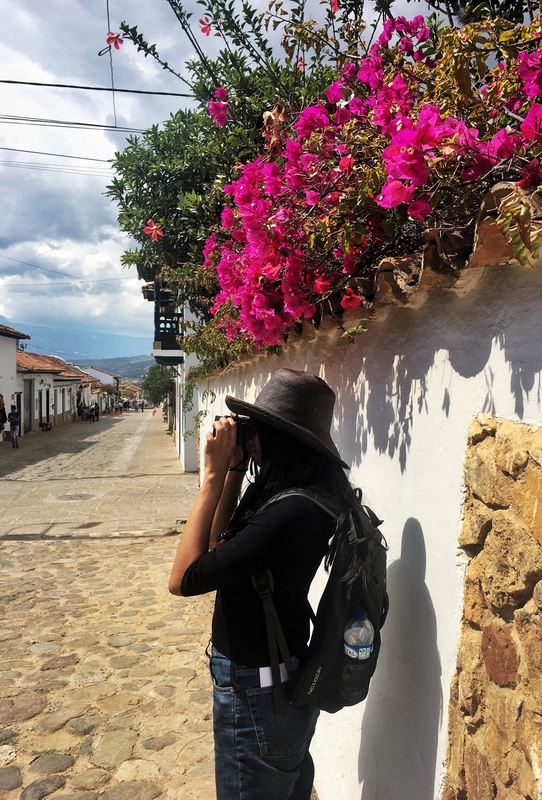 In 2019 the field of contenders was so strong for the Bernard Wheelahan Latin American travel grant that it was awarded to not one but two students to fund their studies in Latin America. The two recipients Eva Touzeau and Siobhan Buckley recently reported back to us on their travels to date, including photos which highlight their time away. 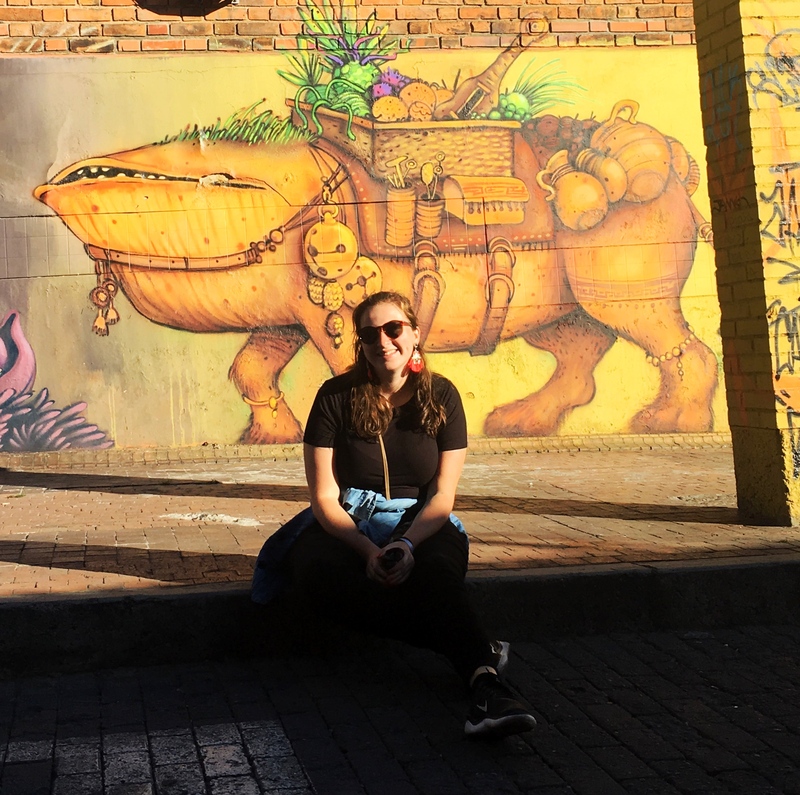 Eva Touzeau, enrolled in a double degree: Bachelor of Development Studies and Bachelor of Languages visited Colombia and undertook studies at the Universidad de los Andes. It’s a Wednesday night. I’ve finished my cinema class, where we watched an arthouse Colombian film about vampires. I head down the main street from the University towards the centre of town. I pass locals, talking and laughing about the day they had, in rapid-fire Spanish. I pass street vendors, offering me freshly cooked Tamales. I find the bar I am looking for and head inside. There, I find a mixture of fellow exchange students and locals, all salsa dancing. I join in, dancing with a friend of mine. He spins me around and around, until I am dizzy. I count the steps in my head; uno, dos, tres, cuatro. I’ve found that I am no natural at salsa. The music slows to bachata, a slightly easier dance. We all change partners, and I find myself facing a stranger. He continuously stops to show me the moves throughout the song. I laugh, embarrassed as always. To me, this is Colombia. I have just finished Week 8 here at Universidad de los Andes in Bogotá, Colombia. Miraculously, I have passed all my mid-semester exams – writing about the intersection of development and interculturality is hard enough in English, let alone in Spanish! Which, I suppose, leads me to believe that my Spanish is improving. I’m using less Spanglish and slightly more Colombian Spanish – es muy chévere (it is very cool). But the improvement of my Spanish is only one aspect of my love for Colombia. Colombia, to me, is yellow, blue and red; the colours of the flag they hang so proudly; the quick swish of skirts as they twirl in a dizzying salsa; the sound of reggaeton, played out of every shop, every car, everywhere, every day. Colombia is the sound of street vendors selling their arepas and empanadas, the smell of the freshly brewed coffee that I buy from a street vender on my way to the university, and the feel of the cool Bogotá breeze mixed in with the hustle and bustle of the busy streets. It is the warm welcome of the locals, so excited to meet a foreigner trying to speak Spanish. I recently went to the coastal city of Barranquilla for Carnival – the second biggest in the world. It was a dizzying extravaganza of colour, music, aguardiente, food and comradery. The locals thoroughly enjoyed coating us gringos in a mixture of powder and foam. We danced in the street with them, intent on teaching us how to salsa like a costeño. 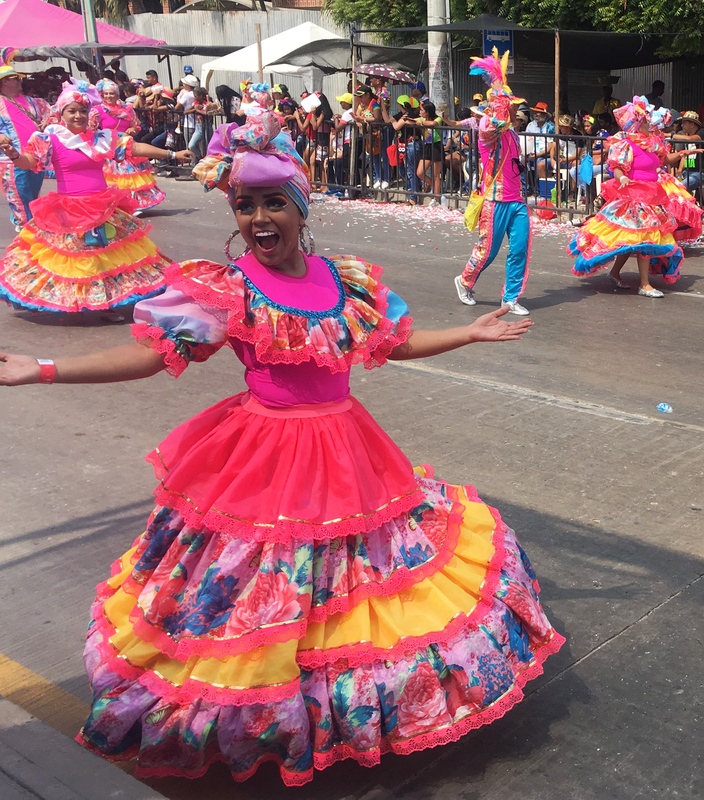 We watched hours and hours of the parade, where Colombians dressed in the most extravagant outfits paraded past, dancing, singing and laughing. It was infectious. Colombia, to me, is culture. And I adore it. I love the flower stalls on the street corners, the tables of chess players furiously playing in the busiest street, the phenomenal graffiti that plasters every wall, creating Bogotá into a living, breathing art gallery, and the friendly homeless man that lives in our tiny street, who makes his money reserving car parks for people. This is Colombia, and I love it. 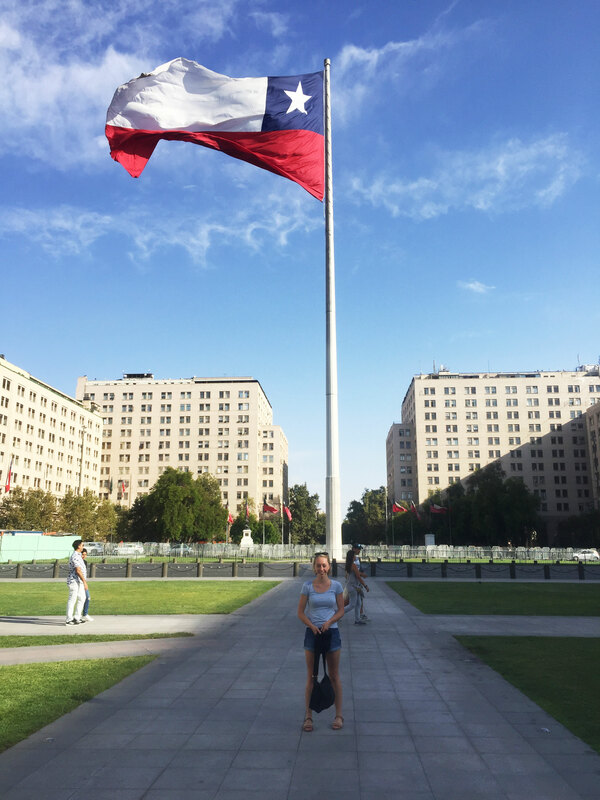 Siobhan Buckley, enrolled in a Bachelor of Languages, is studying in Santiago, Chile. After three weeks in Santiago, Chile, I have already learned so much about this amazing country, culture and language. I decided to come to Chile as I wanted to study in Latin America to learn about the culture in this part of the world as well as to practise and improve my Spanish. I have only started my studies this past week, which seemed to be later during the year compared to other exchange courses; however, I am enjoying my classes so far learning about Chilean culture and history as well as several linguistic based courses. I am looking forward to exploring the culture and language through these courses in more depth throughout the semester. I decided to travel earlier than my course starting date in order to explore Santiago and the surrounding areas. Santiago, the capital of Chile reminds me of Sydney but instead of beaches, it is surrounded by mountains. Within Santiago itself there is an abundance of culture, museums and parks. The culture of this city is quite diverse with its many contrasting neighbourhoods which present architectures from countries the neighbourhoods are named after (eg. Barrio Italia- Italian Neighbourhood). The easiest and most convenient mode of transport within Santiago is the train. One of the places which I travelled to on the train was the Parque Quinta Normal, only a 15-minute train ride from the centre of the city. The park has a small lake and a network of 4 museums including the National Museum, where you can learn about the geographical areas of Chile and the important wildlife in these provinces. Once in the centre of Santiago, many places are accessible on foot, so I often enjoy walking up one of the two main hills in Santiago, Cerro San Cristobal or Cerro Santa Lucía. Both of the hills offer an amazing view of the city and it always amazes me how big Santiago really is. I also have travelled to the coastal town of Viña del Mar for a day trip; however, the day was cold, and the water felt like having an ice bath! I am excited to travel on weekends to the surrounding areas of Santiago throughout my exchange, in order to enhance my educational experience and to learn more about Latin culture.